Homemade Sriracha Sauce. My husband loves sriracha. He puts it on everything. So when we started eating a whole food vegan diet, we took a look at the label of the sriracha. The one that we had been buying was not vegan. In fact, he could only find one brand of sriracha that was vegan. Most brands contained a fish sauce and a lot of preservatives. Even the vegan brand contained preservatives. So he finally decided to make his own homemade sriracha. Turns out it’s pretty easy to do! This homemade sriracha literally takes almost no time at all to make. Most condiments are very easy to make yourself. You can check out my roundup of healthy condiment recipes here. 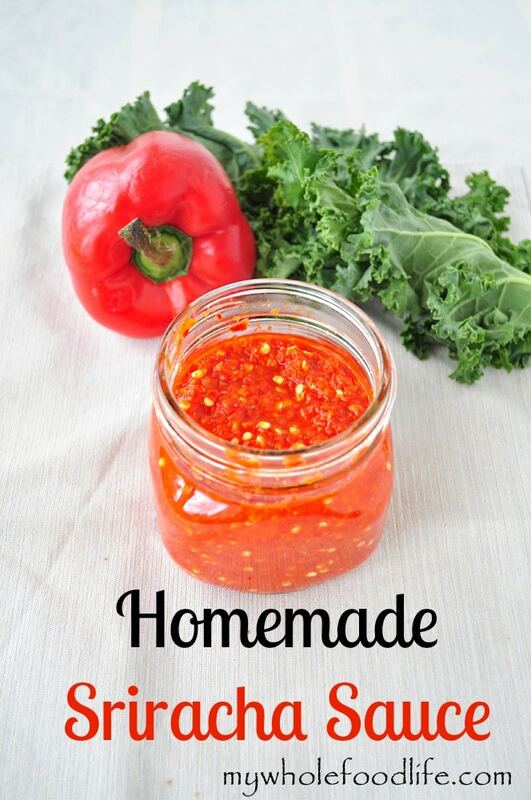 This popular sauce is easy to make yourself! Cut the peppers and mince the garlic. In the food processor , add all the ingredients and pulse until everything is mostly broken down. Add the processed mixture to a saute pan and cook on high for about 5 minutes, stirring constantly. Remove from heat and let the mixture cool. This sauce is very spicy. If you like less heat, you can remove the seeds or even use less hot peppers. Sriracha should keep in the fridge for a couple months. You can also freeze it for longer storage. Oh my gosh! So happy someone finally did this, I used to be in looooove with sriracha!! Yay! I hope you enjoy the recipe! Wow! I never thought of making sriracha at home. Now that I see how easy it is, I will make it myself. I agree that the store bought one is too processed. I hope you enjoy my recipe. The picture had my mouth watering at first glance. I always like to make my own condiments and sauces to avoid all the preservatives and this is a perfect addition to my list. Thanks for sharing. Can't wait to make and try this. You are so welcome Kathy! I hope you enjoy the recipe. Just wondering, I try to buy organic in general but what is the significance to buying organic vinegar? Is there something specific about conventional vinegar we should be avoiding? And thanks for this recipe, I will be making ASAP! I just say that because vinegar is made from corn and corn in the US is mostly genetically modified. Oh gosh, great. I totally didn't realize vinegar was made from corn. Thank you so much for the knowledge! I was born on a farm 75 years ago and never heard of vinegar being made from corn. It has always been made from Fermented apple juice. You go to making vinegar with corn and you wind up with Corn Whiskey. That is good to know. I can't remember where I heard that. Your comment threw me off because I had never heard of vinegar being made from corn. I thought it all came from apples. Had to look it up and you are right. Cider vinegar is made from apples as Jerry stated, but "white distilled vinegar is made with grain, corn and water; although, Heinz states that white vinegar can also be made from fruit or any material containing sugar." Thanks for the info (and the recipes)! Thanks for sharing this recipe! This is one of my goals for this year, make hot sauce from our garden. I'll definitely be trying this recipe soon. Wow! So excited to try this! I hate to even ask...but, is coconut sugar mandatory or will any other sweetener work? Thanks for sharing! Another sweetener should work as well. This looks DELICIOUS and super easy to make. How did your husband like the taste of it in comparison to the bottled stuff? Just curious, since he's the big Sriracha fan. How great! Love it Melissa. This sounds great. I am wondering though if it burned your throat when you were cooking it. Often when I'm cooking hot peppers, the fumes from the cooking burns my throat and eyes and my husband and son are particularly sensitive to that. I would have to ask my husband. He cooked it. I guess if that was a concern, you can always wear safety goggles. Can't wait to try this. We moved to Ecuador before this took off - and on our trip back to Canada a few weeks ago I was shocked at how popular this has become. We grow Fatalli peppers, which are a bit hotter than habanero peppers and, my husband claims, have more flavor to them. Do you think these would work in this recipe? I think they probably could. I live near the sriracha plant, they only use red jalapeños in there sauce. Jalapeños have a unique flavor all their own as do other chilis. I'm sorry but I'm a chili purest. I live in Ottawa, ON Canada. I have never seen coconut sugar, any idea where I might be able to find something like that? Thanks. You can find it on Amazon. Or you could use another type of granulated sugar. Thank you. I will check there. You can find coconut sugar at the Bulk Barn. Sometimes it's called Coconut Palm Sugar. It looks sort of like brown sugar. Health Food stores will carry it too. Costco has it. I buy it in Kelowna,B.C.,Canada . I think all costco's carry it. I MADE THIS RECIPE AND LOVED IT.. MY ENTIRE FAMILY THOUGHT IT WAS LIKE THE ORIGINAL SIRACHA SAUCE.. I just made this for my boyfriend who has his photo on the wall of a local restaurant in Thailand for eating the most chili peppers in one meal: 18. lol. I'm not sure if you're supposed to keep the seeds in the recipe (I'm assuming you are because I see the seeds in the picture haha) but I licked my finger which had the tiniest amount of sauce on it and my throat burned. Perfect :D I can't wait to see what he says! Haha! Let me know what he thinks!